5.0 out of 5 starsLove Money delivered! 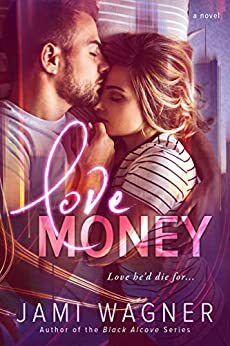 I absolutely LOVED "Love Money"! Charlie is likable and relatable...Jett is smoldering and HOT! There was not a dull moment in this story - lots of reading fast to know what's going to happen but wanting to read it slower because it's so interesting! The dynamics of Charlie, Jett and their loved ones along with the *not going to spoil it for you* bad guys were intense. I liked the mystery in this story - I haven't seen a set up like this one before and it kept my interest from start to finish. I really enjoyed Jami Wagner's writing style in this book. I highly recommend "Love Money"! Love Money by Jami Wagner is a fast paced, full length, standalone. Take one stalker, one lier, one who needs to be alive and one who'll kill her, maybe + someone died because of her, mix it up with a captivating storyline, and you get Love Money. Jett Baxter is an enigma. He's like a chameleon, changes his colors. Charlie Campbell is a young woman with big commitments and even bigger danger is following her. And Jett isn't helping at all, he's the reason for - sorry no spoiler here, only so much, I started reading and was captivated. I read the book in one sitting, I couldn't put it down. The writing is great and the story is to die for. I was greatly entertained by this book and give 4,5 stars. 5.0 out of 5 starsWhat a great read... fast paced action, suspense and HOTNESS!!! First read from this author, great book!! Her characters are fabulous, totally relatable and the storyline was one that kept me up reading until late into the night just so I could see what happened next!! Charlie and Jett are like DAMN hot together and with all the other side characters it makes for one hell of a ride! There is murder, mystery, suspense and a whole lot of action... something to tickle the fancy of even the fussy of readers, I'm off to find more of this authors books to indulge in I highly recommend her writing!!! 5.0 out of 5 starsTwists, Action and Suspense! Charlie has her hands full with one stalker, one liar, one she needs to save and one she needs to avoid, and it all becomes the adventure of a lifetime. This is a twisty action packed ride filled with suspense, great characters and a love too strong to be denied. This is a story that should be experienced first hand without spoilers but just know that you won’t be disappointed. I voluntarily reviewed an Advance Reader Copy of this book.